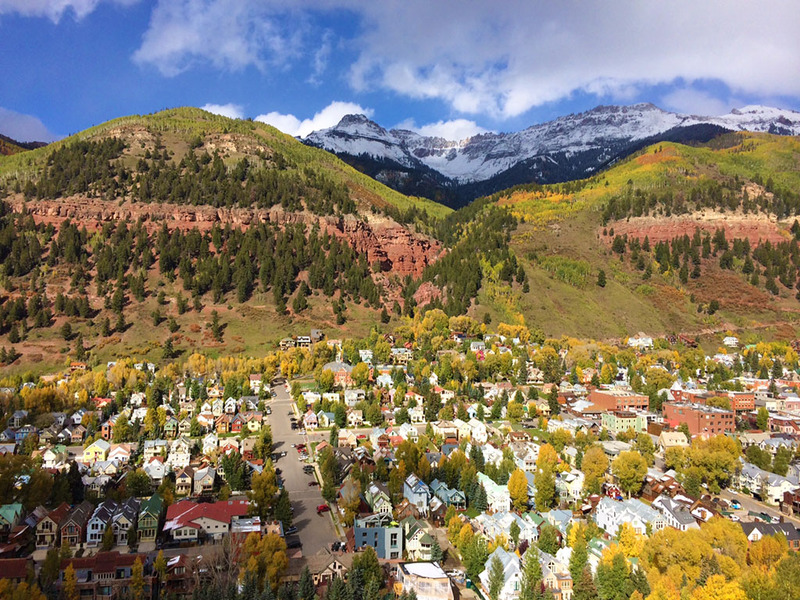 Telluride is an exclusive small town paradise loved by locals and visitors alike. The town has a very friendly atmosphere with speed limits set to a maximum of 15 miles per hour. Walking and biking is the preferred method of transportation throughout town. It usually takes about 20 minutes to walk from Town Park located at the east end of town to the furthest end of town located west on Hwy 145. Telluride was founded in 1878 and was originally named Columbia. The town was was renamed nine years later in 1887 to the Town of Telluride to avoid confusion with another town named Columbia. The first gold mining claim was made in 1875, three years before the town was actually established. The town of Telluride is the county seat and the most populated Town in the San Miguel County. Telluride’s historic district is listed on the national register of historic places and it encompasses a good portion of what we call downtown Telluride today. The town is also one of Colorado’s 20 national historic landmarks. Telluride’s population is somewhere around 2500 and usually fluctuates ever so slightly. The town is located in a box canyon at an elevation 8750 feet with panoramic views of jagged mountain peaks, steep tree covered mountainsides and the Ingram Falls. Telluride’s remote location and unbelievable scenery makes it a desired destination for visitors from around the world. Modern Telluride is a very popular ski resort and a sought out Summer retreat destination. Telluride offers residents and visitors many conveniences including a regional Airport, medical facilities and an emergency center, one of the best school districts in Colorado and let’s not forget about Colorado’s friendliest people who made Telluride the friendliest town in Colorado. Telluride Winters offer skiing as you have not experienced in decades with NO lift lines and terrain/snow for every skill level. On-mountsin restaurants are world renowned with surprisingly inspired culinary creations. When off mountain the après ski options are plentiful yet all exceptional and many with an "old-world" après ambiance. To feed your soul and rejuvenate well-used muscles there are plenty of state-of-the-art spas with the latest massage therapies which will rekindle your mind, body and spirit. Up for an "evening on the town"? The Telluride Arts District and Michael D. Palm Theatre offer events and performances for even the discriminating entertainment guru. Outdoor enthusiast can take a family horse drawn sleigh ride through the surrounding Nationsl Forests and private ranch lands. For your littlest ice skaters there are venues in both Mountain Village and Telluride's Town Park. Telluride Summers are second to none. From the acclaimed outdoor activities for children and teens offered by Telluride Academy to the adult focused Art workshops at Ah Haa School for the Arts there is surely something special and memorable for everyone in the entire family. There are also the superior outdoor adventures of hiking, horseback riding, jeeping, fly fishing, mountain biking, nature viewing which can be arranged via guided tours or just taken at one's whim. Then there are the Summer Festival that the Town of Telluride has become known for, starting with MountainFilm Film Festival in late May and continuing with the Balloon Festival, Telluride Bluegrass Festival and Telluride Wine Festival in early summer. These world renowned festivals kick off summer with the 4th of July Celebration followed by the Telluride Yoga Festival, Telluride Playwrights Festival, Telluride Jazz Festival, Telluride Mushroom Festival (Shroom Fest), Telluride Chamber Music Festival, ending the August lineup with the prestigious Telluride Film Festival (one of the best in the industry) . But they do not end there... September has the famous Telluride Blues and Brews Festival as well as the Telluride Barbeque Festival. October ends the Telluride Festival summer season with the ultra cool Telluride Horror Show Festival. Telluride Homes for SaleFind the perfect Telluride mountain home with convenient one click access to homes located in downtown Telluride. Telluride Land for SaleVery few lots are available in downtown Telluride. Limited growth policies prohibit new land development. As of Jan 30th 2014, there are only 26 vacant lots available for sale. Get yours while you can.